Certain categories of personnel can receive advanced paygrade status upon enlistment in the United States Army. Has completed 2 or more years of Junior ROTC (JROTC) or a National Defense Cadet Corps (NDCC) Program. Has completed 1 year of Senior ROTC (SROTC). 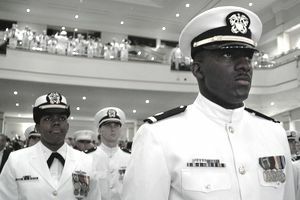 Has attended any U.S. military service academy or U.S. military academy preparatory school for 179 days or fewer (or at grade determined by the amount of college credit completed, whichever is greater). Has successfully completed 24 or more classroom semester hours (36 or more quarter hours) at an accredited degree-granting college or university listed in the AIPE* or NACES* (foreign transcripts must be evaluated). Has completed all phase II requirements of the Air Force Civil Air Patrol and has been awarded the Billy Mitchell Award. Has taken part in the Naval Sea Cadet Corps (NSCC) and has been awarded the Quartermaster Award (Certificate). Has been awarded the Boy Scout Eagle certificate as a member of the Boy Scouts of America (Form 58-708), or the Sea Scout Quartermaster Award Certificate or the Venturing Scout Silver Award. Has earned the Girl Scout Gold award certificate as a member of the Girl Scouts of America. Has successfully completed 48 or more classroom semester hours (72 or more quarter hours) (without a 4-year degree) at an accredited degree-granting college or university listed in the AIPE* (foreign transcripts must be evaluated). This includes those with associate degrees. Has successfully completed 2 or more academic years of a postsecondary vocational-technical school and has received a certificate of training attesting to successful completion of the course. The school must be listed in the AIPE*. Has successfully completed a degree-producing college program of 4 years duration and the college or university which is listed in the AIPE* (and has been awarded a bachelor’s or higher degree) (foreign degrees and transcripts must be evaluated). Advanced promotion is authorized if college or university provides a letter stating the applicant has met all requirements for a degree, but it will not be awarded until the commencement ceremony. Members who lack documentation required for advanced promotion under the above conditions at the time of enlistment may submit supporting documents to the personnel officer within 6 months of enlistment. Documents must be original, certified, or evaluated as required. Effective date and date of rank for soldiers who lacked documentation at the time of enlistment will be the effective date of the promotion by the unit commander. No retroactive adjustment is authorized. In addition to the above, the Army will give advanced enlistment rank to applicants who, while a member of the DEP (Delayed Enlistment Program) refers others to their recruiter for enlistment. To qualify, the referrals must enlist in the DEP before the applicant ships off to basic training (referrals who enlist in the DEP after the applicant ships off to basic, don't count). Those who qualified under the Army Civilian Acquired Skills Program (ACASP) may enlist at the paygrade of E-4. *AIPE is the Accredited Institutions of Postsecondary Education (AIPE) book published by the American Council on Education (ACE). NACES is the National Association of Credential Evaluation Services. How Does the Navy Buddy Enlistment Program Work?